Are You Seeking a Survival Enforcer or a Thrive Strategist? The choice is yours. 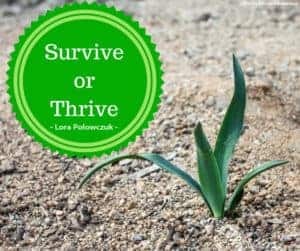 What mode do you generally sit in, survive or thrive? Are you scraping bottom, rushing from one thing to the next, aimlessly wandering on to the next task on your ever growing to do list or just making ends meet? Perhaps you feel good because you’re always busy. And, since you’re busy this gives the appearance to others that you’re working on something important. You enjoy the comfort of your surroundings and don’t want to rock the boat. I mean if you rock the boat or steer it in a different direction, you may get hurt, right?!? And, people may not like us anymore. We definitely want to be well liked by everyone. And, the thought of failing at something would just be — horrible. Or, are you focused, carefully planning each step towards your dreams. You grow with every step, either learning from the mistake and attempting a new approach or figuring out the next step after that one. You adjust the direction of your boat based on what you’ve learned and how they may apply to the next step. This allows you to be open to what’s coming next and allow for new opportunities to arise in the process. Where do you fall? The first is survival mode. Its where a lot of people sit. According to Maslow’s hierarchy of needs, we seek safety and security first. Do we have shelter, food and water? Yet, we also want to be validated and stable, and free of fear. This craving for stability and security keeps us trapped in a box. We love the box. It’s safe and we don’t get hurt. Security is knowing exactly what happen when. It’s if I do this, X will happen. Yet, then, we feel stuck in a box. Sound familiar? The second mode is thriving, to flourish, prosper, and succeed. In order to flourish, we must triumphant over what holds us stuck. It’s not easy to make ourselves vulnerable. (Did you know that vulnerable is the antonym for security?) It’s not easy to fail and pick ourselves back up, assess what happened, and apply the lessons learned. I mean – that’s down right difficult. It’s not easy to take the courageous leap into the unknown without a clear point of where we may land. Yet we want to feel what it’s like to flourish – to thrive – to succeed. Yet we recognize when we give up our attachment to the outcome, we will likely get something bigger and better than we expected. The choice is yours. Do you seek a Survival Enforcer? Or, do you seek a Thriving Strategist? If it’s the latter, Courageous Path’s program offers the steps and know how to keep you on the thriving cycle and teaches you how to take the courageous steps to keep you thriving. Contact Lora, Chief Energy Officer, for a free strategy session. While doing an errand, I had to parallel park. Easy, peezy, right? Well, this time it was truly difficult. Say what? Why? My car windows and mirrors were soooooo dirty from driving on salty, snowy roads in the mountains, I literally could not see out them. It was like looking into a cardboard box knowing something was on the other side but you couldn’t tell what. Recognizing this was acceptable to drive with either, I headed to a do-it-yourself car wash. It was the first place I could think of close to where I was. So, I’ve never been to wash-it-yourself car wash before. I went because I figured I would save money and time. Well, that was sooooo not the case. I spent more money throwing quarters in and doing it myself then just going to a drive-through car wash. Not to mention, I got myself dirty in the process. More time, more money, plus dirty. Not really what I wanted. So, why do I share this? Simple. Sometimes we think doing it ourself is faster and cheaper. The reality is – this time it was not. 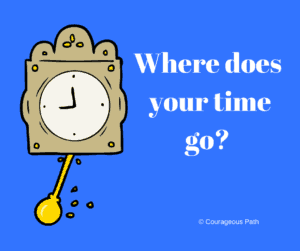 Think about – where does your time go? Do you evaluate where you can save time? Take a few minutes and evaluate how and where you spend your time on a daily basis? Yes, I’ll wait. Really. This is something you should take a moment and do right now. Let’s figure out together how you can be more efficient with your time. Sign-up now for a free strategy session to move evaluate where you are and where you want to go. Wishing you a wonderful and efficient day! Are you pouring from an empty cup? It seems like everyday people are asking for our time, energy, and resources. Your spouse may want you to fix the house or go to the grocery store. Or, there’s another board meeting for the non-profit you sit on. We naturally want to help out. We want to please people. We want to make sure others are taken care of. We want to do good in the world. Yet, all of this comes at a price. When we always take care of everyone besides ourselves, we begin to lose our essence. We deplete our own energy. We put our passions aside. We even forget what brings us excitement. The funny things is. We tend to think it’s selfish if we focus on our needs and wants. We even feel guilty if we do something for ourselves. In fact, others may call us self-centered if we take care of ourselves. Think about. How often do we take the time to refill our own energy tanks. How does a car move without gas in the tank? How can you pour your love and heart into someone or something if your own cup is empty? So, how do you replenish? How do you fill your cup back up so that its overflowing instead of empty? Its not enough to take a vacation once a year. What will you begin TODAY to re-energize yourself on a daily basis? Self-care is a habit and a practice. I do this through outdoor activities. What’s yours? Let’s work on this together. Sign-up now for a free strategy session to move you forward and replenish your cup. The New Year always brings a wave of new goals, dreams, aspirations and changes we want to make. But, the true kicker is – Are you really committed to making them happen? Can you really commit to 10 projects, 5 groups, 6 social engagements, kids, activities, a partner, a home, your pet, etc.? I bet you’re overwhelmed just reading that. So, let’s take a step back in order to take two steps forward. Our aspirations rarely drop into our laps or are easily obtainable. We must take the necessary steps to reach our dreams. We can day dream all we want. However, if we are not willing to take steps each day to get there, all we have are dreams that are never reached. What can you really commit to? Once you’re committed on a daily basis, you develop the discipline to reach where you want to go. Here’s an example of how this recently appeared in my life. In mid-December, I turned a very enjoyable day in the mountains into utter pain and headache. While hiking up a mountain carrying skis on my pack, I developed bad neck strain which turned into a debilitating headache. My shoulders and neck were not strong enough. It sucked and hurt! Instead of complaining or giving up, I was determined to figure out how to loosen the tightness and figure out where I wasn’t strong. I committed to daily joint exercises to open up the area and evaluated different gyms to change up my strength and conditioning routine. After 3 weeks of implementing these changes, I can now hike with a pack without a headache. What was the difference? I was committed to seeing what worked and what didn’t to improve my condition. Was it easy? No. Did it take time? Yes. Was the time invested worth being pain-free? Absolutely! When was a time that you went all in? What trade-offs did you make? What steps did you take to get there? How can you apply those steps to a current situation/activity? When was a time that you fell short of a goal? What happened? What got in the way? What did you learn from this experience? 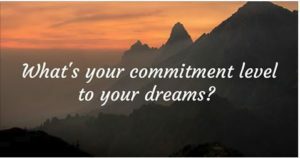 From this day forward, what commitments are you willing to make to reach your aspirations? Watch how the small daily commitments transform into larger aspirations over the long run. Wishing you a pleasant, peaceful, and joyful day! How Do Your Choices Serve You? As we begin 2017, we are plagued with the yearly questions – What are our resolutions? What are our goals? What do we want to change? I bet you’ve received countless emails about this! Inevitably, we often fail at these changes in just a few weeks or the first couple months of the year. We want the quick fix – How do I lose 20lbs in 30 days? Or, How do I make more money? When this doesn’t happen, we throw up our arms, say we tried, then give up for the remaining 10 months of the year. Which leads us to saying how much X year sucked and we’re ready to move on. And, then we repeat this year after year. Does this sound familiar? The funny thing is – we often don’t ask the right questions. Instead, ask – What type of life do I want to have? Then, ask – how can I lead my life to get there? LEAD – is an important word here. LEAD is where you take ownership of your choices and decisions to get there. The ultimate person leading your life is you. No one else. It’s your choice what attitude you have. It’s your choice if you’re distracted. It’s your choice how you react to situations. For this year – will you take ownership of your choices? In leading your life, will you acknowledge where you excel? And, where you slip up? Its about being honest with yourself. For example, if we want to lose 10lbs but think weight will just melt off us without the work, we are just kidding ourselves and setting yourself up for failure. Instead, think about what choices got me to the point where I want to change? What did I learn from this? 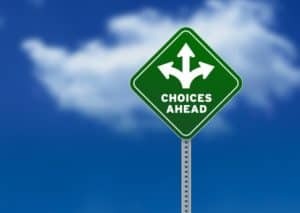 How can I make better choices in 2017? Let go of any tension that you feel in your body. Take 3 deep breaths so that your entire abdomen expands. What do I want my 2017 year end headline to read? Next, put the 3 words you selected in a place you will see them everyday. (Perhaps, a sticky note on your mirror or in your phone as a daily reminder.) Let these words guide your choices for 2017. For every choice you make, identify on you use these words to honor yourself and those around you. What courageous choices will you make this year? Wishing you a prosperous, abundant, and joyful 2017!